The unsettling weather will reach Britain's shores overnight between Sunday and Monday morning battling with the already freezing conditions caused by a Scandinavian front set to leave the country. Cold temperatures will gradually rise towards the end of the week but frost will still be the key weather element for many to wake up to on Monday morning, with temperatures below freezing levels in the early hours of the day. 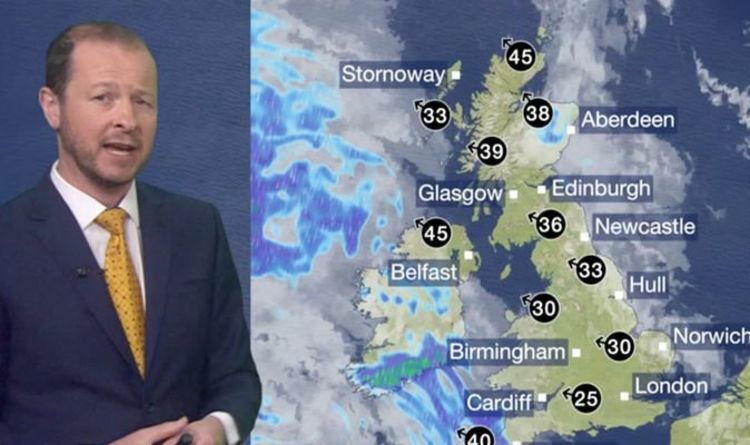 BBC Weather forecaster Darren Bett warned strong gales will sweep in from the south across the country during the day causing potential disruption. He said: “This evening skies will clear in many areas. We’ll keep cloudy skies for Northern Ireland across parts of Wales and the south-west with perhaps a little bit more rain coming in as well. “There will be a touch of frost, more likely across northern England and Scotland, not as widespread as recently and that’s because the winds will be strengthening. “Despite those clearer skies, temperatures shouldn’t get quite as low. “For all of us, it’s going to be a windier day on Monday. “Gales possible for Northern Ireland and across the south-west of England together with that risk of rain. “Temperatures here, on the whole, a little bit higher than we’ve seen today. “The windy weather comes with that area of low pressure running close to the UK. The weather is, however, set to change for the better towards the end of the week, when temperatures are set to rocket to up to 24C for some. Warm air will sweep in from the continent next week, seeing temperatures from the mid-teens and up all across the nation. Some models have even gone so far as to predict the temperatures could climb up to 24C in some parts. The Met Office forecast says we can expect the dry and sunny weather to begin on Thursday. He said: “Things will start to feel a lot more spring-like and temperatures will rise into the mid-teens.